I hope you’re not yet tired of hearing about my housewarming party, but there are so many elements that I want to share for those of you like me. Those who love to take care of your guests, but don’t necessarily want to spend a lot of time and money doing so. The last detail I’d like to share is the take home gifts! I planned for two prizes, one for each game. One I knew was going to be a wine basket, because, really, who doesn’t like wine? The other I was totally unsure of until I found it on Pinterest (duh). 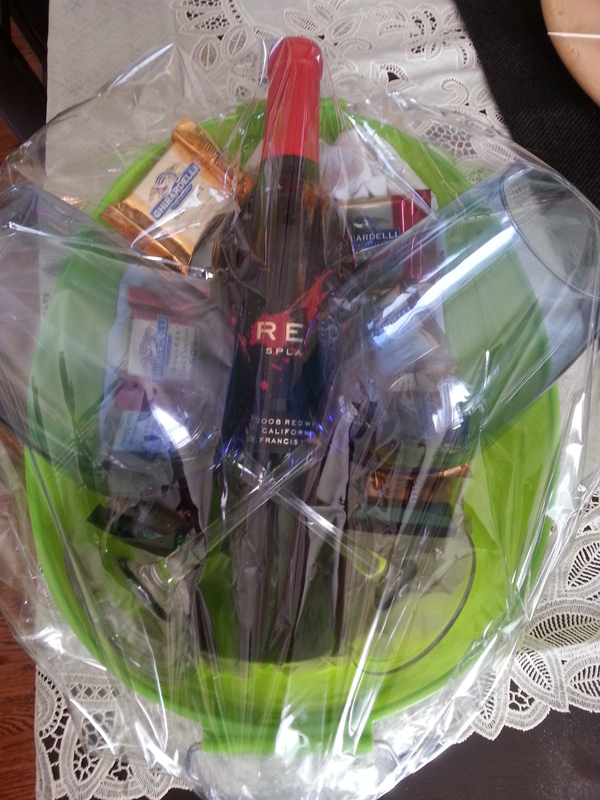 To make this basket I bought a dollar store bucket that looked like it could be functional, two dollar store wine glasses (surprisingly good quality), a variety pack of Ghirardelli chocolates and a nice bottle of red wine. I probably spent less than $15 on the entire prize. 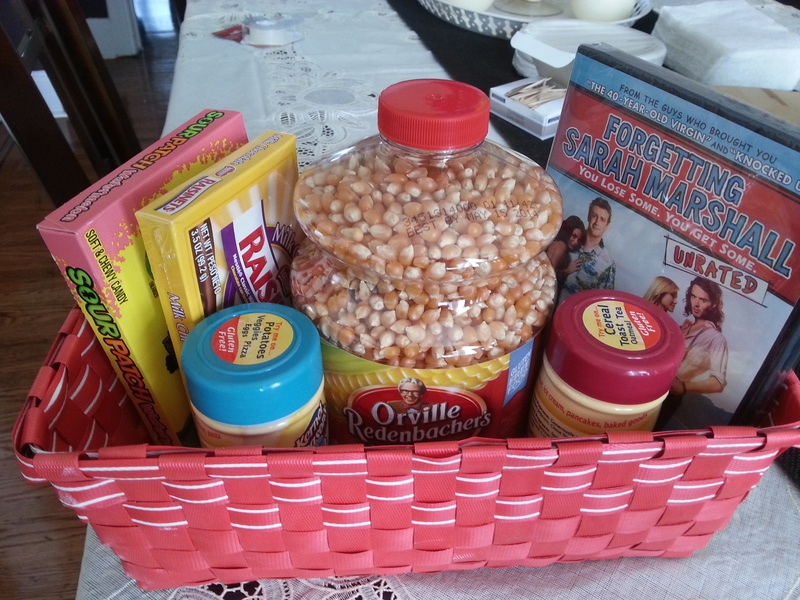 To make this I bought a basket from the dollar store (was looking for the big plastic popcorn bins, use that if you find them). The popcorn kernels I bought at Wal-Mart along with two different popcorn seasonings and 99 cent movie candy. The movie I just had lying around since it was my second copy, but you could easily get a nice movie from the $5 bin. I wish I had time to print out directions on how to pop kernels on your stove top, but next time I’d include that too. I probably spent $11 on this prize. Since I had two winners for the first game and hadn’t planned for it, I didn’t want to nix the door prize so I used an extra bottle of champagne I had instead. Having extra alcohol is a win sometimes! My next take home gift was probably something you’ve seen around the internets before. 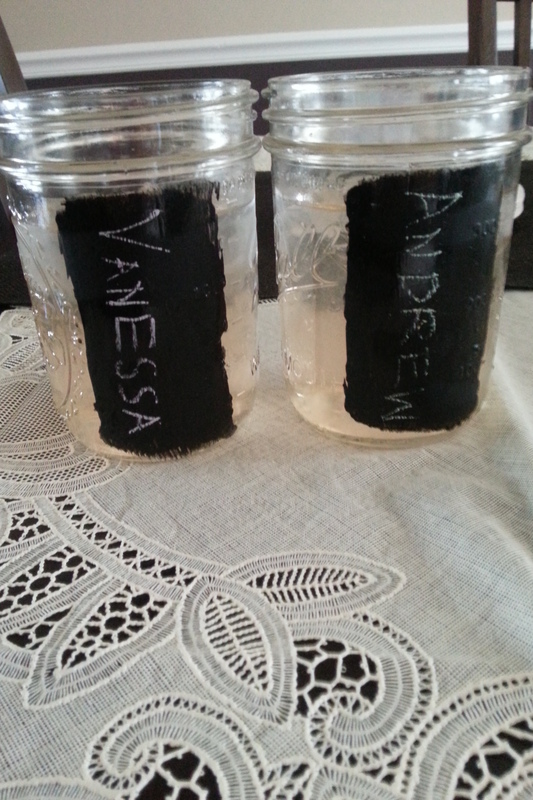 It’s the infamous mason jar. 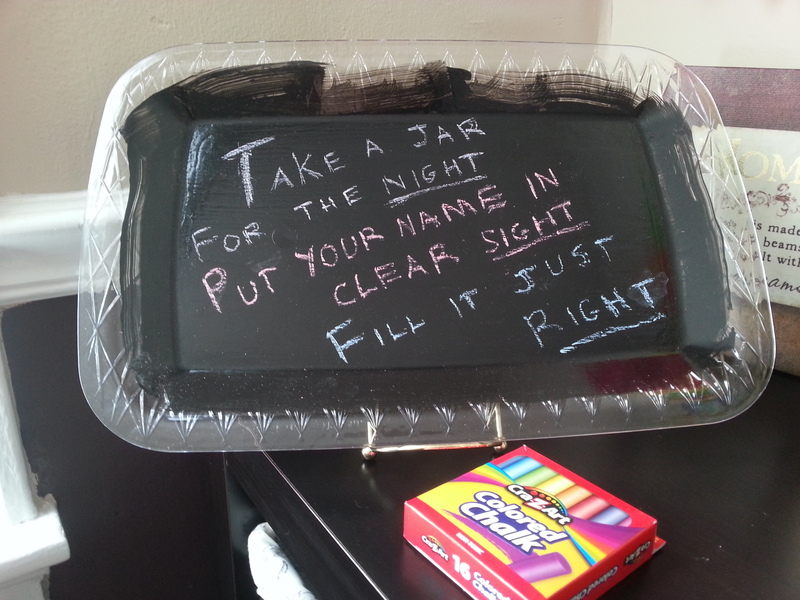 I really did not want to dispose of 100 cups after my party and my guests were so excited to write on and keep their jars after. One thing to account for, the condensation from cold drinks totally rubs off the name after a while. Anyone know how to remedy this? I heard there are chalk pens so might try that next time. 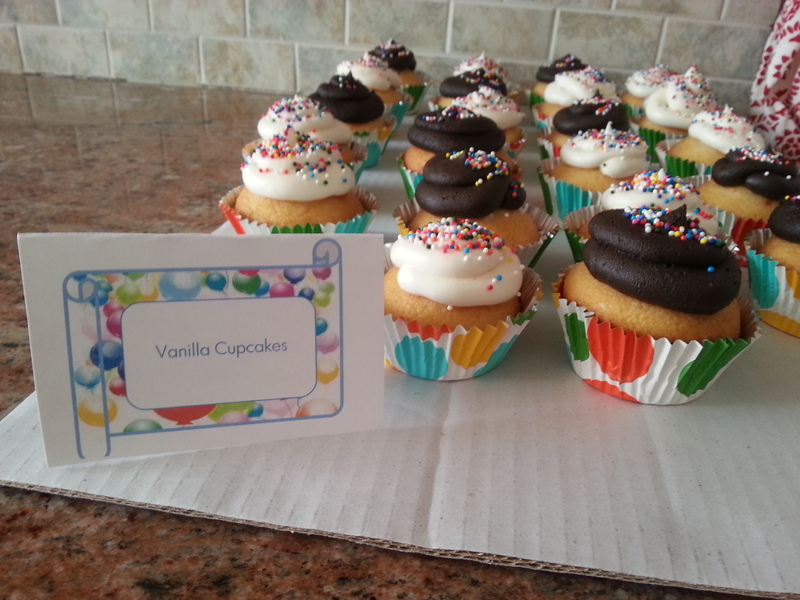 Last are my favors. I went through many ideas, but in order to keep my cost down and still have a useful gift, I decided that candles would be perfect. I found the perfect amount: 12 packs of votives at Michael’s for only $8.99. A tip: They take competitor’s coupons and in my case A.C. Moore had a 50% off coupon that week. That means I got 24 favors for only $8.99 plus tax! 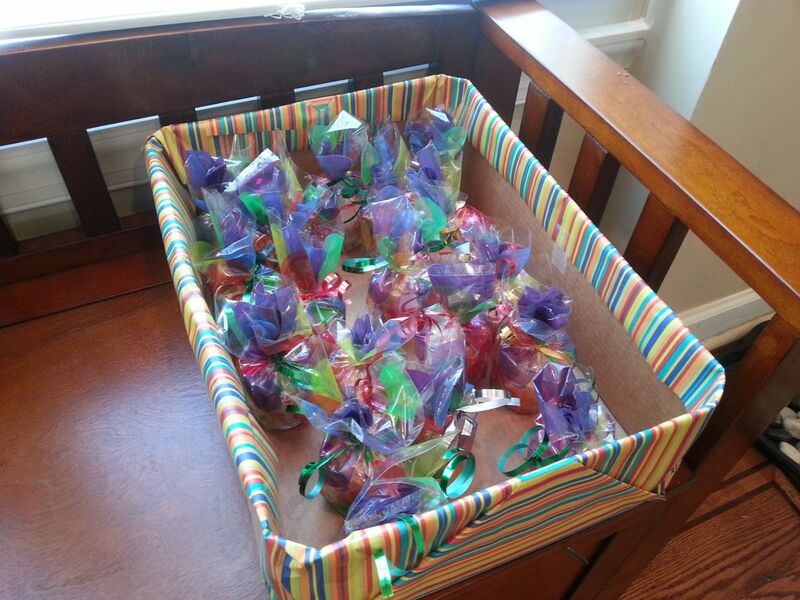 All of the favors wrapped up! To make them personal I printed clear labels with “Thank You” written on them and stuck to each one, then I wrapped them in balloon favor bags from dollar tree. 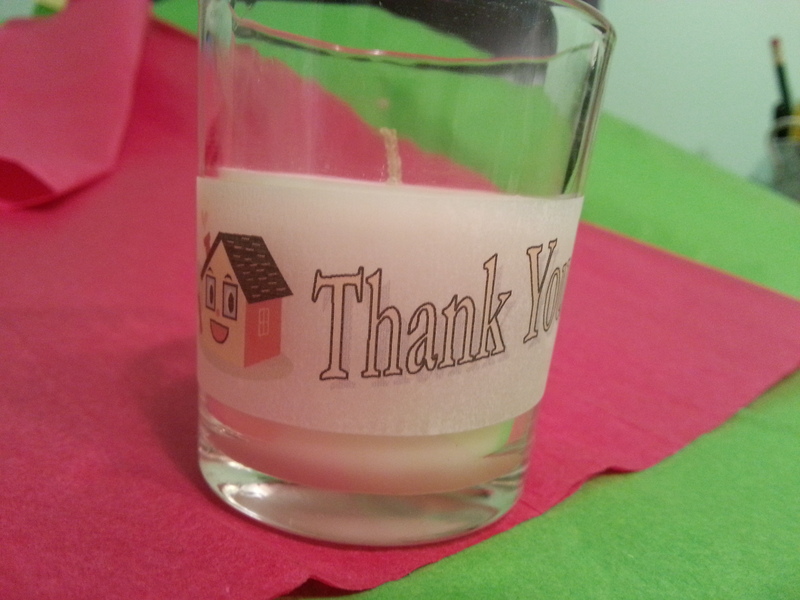 A nice, thoughtful, and inexpensive way to show a little appreciation for your guests! Parties are fun because you can often get lost in various conversations with new or old friends, eat good food, and just enjoy yourself. I definitely don’t think there is anything wrong with just socializing at a party. However, I’m a nervous person! I think of all the possible scenarios that could go wrong and try and plan for it. So when I knew I was going to have a totally random and assorted grouping of friends for my housewarming I was nearly panicked by the thought that…gasp…what if no one spoke with each other! I know, totally ridiculous. A party with games and activities, though, so much fun! 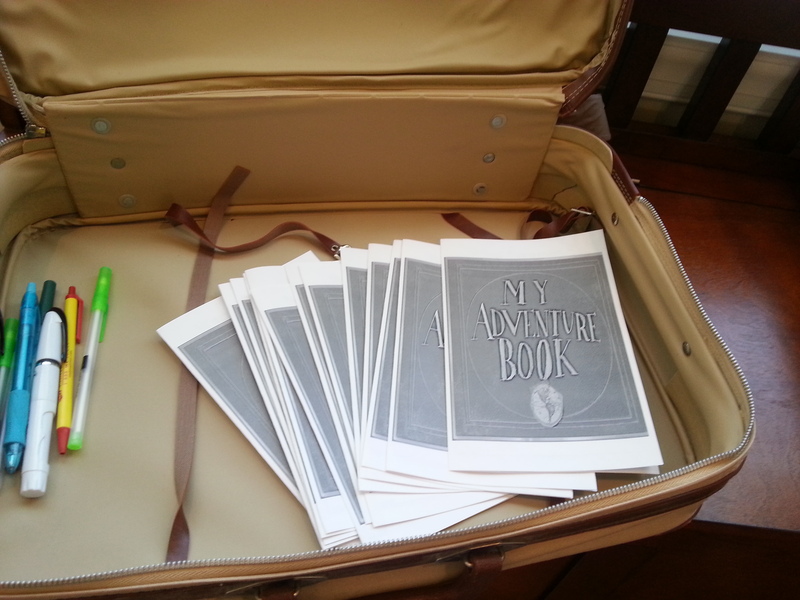 After filling our tummies and natural pauses in animated conversations started I brought out the “My Adventure Book” pamphlets I made for everyone. I had two activities and the game was that the first person to fill out the entire booklet correctly would be declared winner and get a choice of two prizes. I totally got the game ideas off of Pinterest! 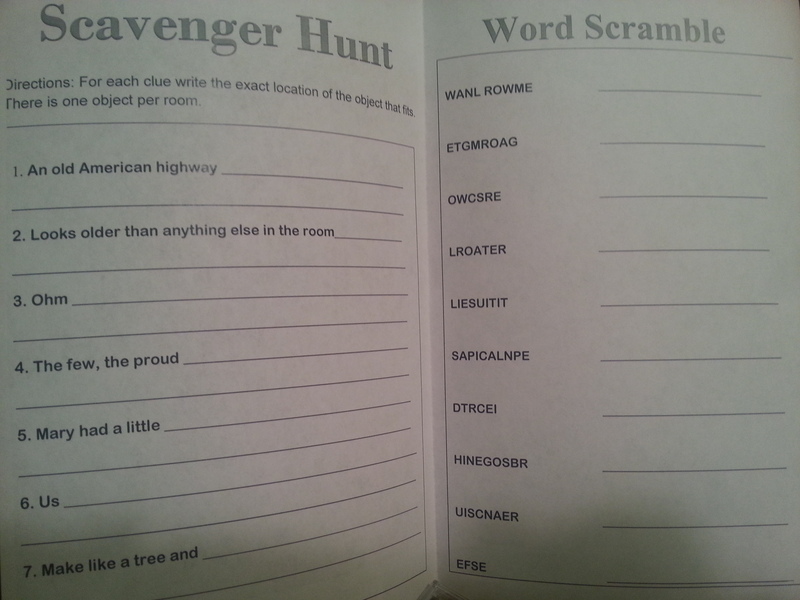 One was a scavenger hunt with vague clues about objects in my home and they had to describe where they were. The other was a word scramble with answers that related to home ownership. This little activity really was a hit. I wish I had thought to take a picture of everyone leaning against walls and chairs to fill in their answers. In the end, we had two winners (of course I didn’t plan on that ha!) and they were excited by their prizes. The last “game” was a door prize. I think door prize games are nice because they don’t have pressure and it’s totally based on luck/fate if you win. To go along with Pixar’s Up theme, when filling the balloons I left a handful to fill with fake money I had lying around the house (random? yes!) and folded up so you could not see the dollar amount. As each guest was leaving they would pick a balloon to pop with a safety pin and the person who got $100 bill won the prize. 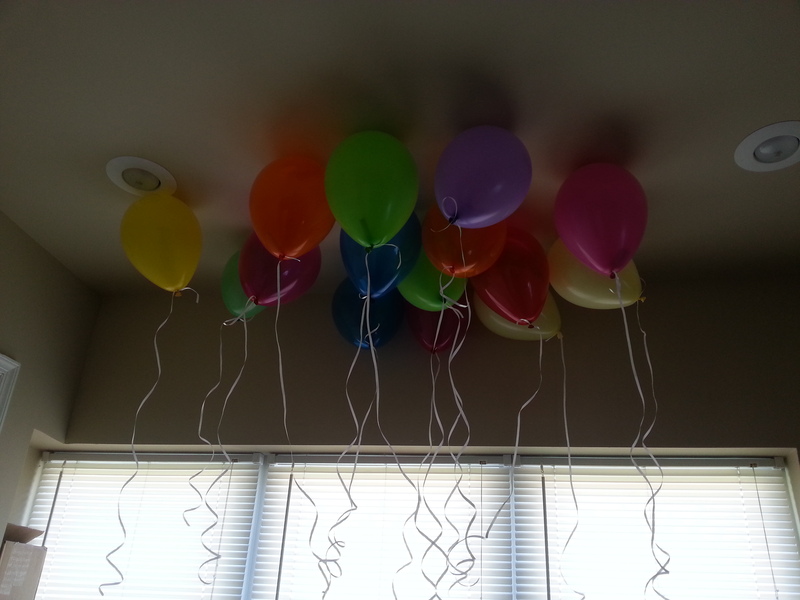 The last engaging activity was less of an activity and more of something to remember my housewarming by. 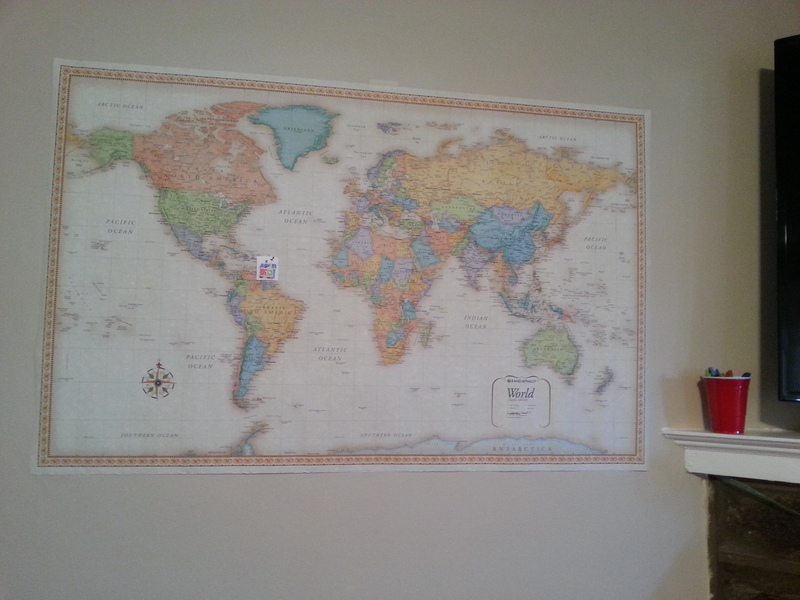 I have decorated my guest room with a travel theme, and really wanted a map to hang. The boyfriend and I found the perfect one at Staples, with a vintage style. I figured it would be the perfect “guestbook” for my housewarming and for future guests to our home to sign. Can you find the Up house? All in all, the activities weren’t too much and fit right in with the flow of the party. Feel free to try these ideas out at your next party as well! I would argue that one of the most important elements of a party is the menu. When your guests are happily sated with food, they are much happier to be at your house and with company. And lets not forget food is a conversation piece many a time. Because I think this is so important I’m super sad I got little to no pictures of the food. 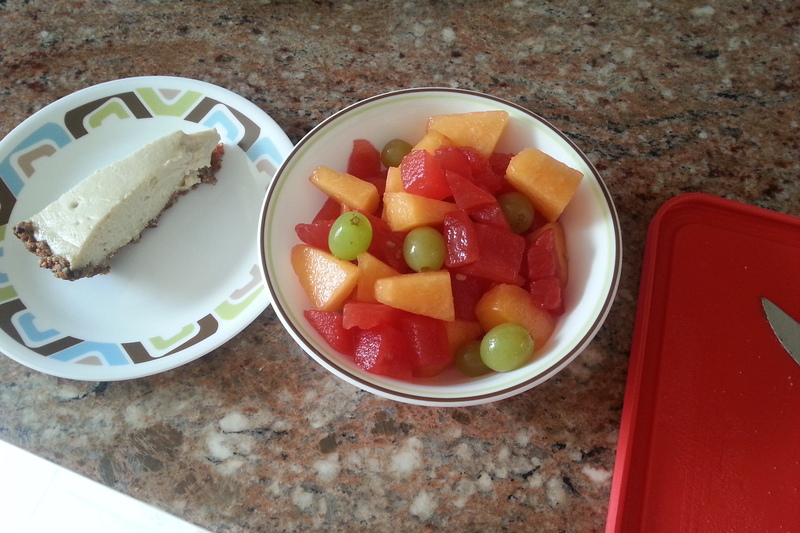 However, I will share with you my super simple menu and where I got some of my ideas/recipes from. Let me preface by saying I strove to have many healthy choices, for myself and many of my guests eating clean and whole is very important. And sometimes its fun to have a cheat here and there. Three assorted cheeses with crackers. We chose pepper jack, cheddar, and havarti dill. It’s also nice when you have gracious friends like mine who made dairy free chia brownies and a delicious beet hummus that was a big hit at the party! This menu was extremely easy to execute, pretty much everything was put together the day before and because my party started at 2, I had time to warm up or cook whatever I needed. All the pizza crusts were store bought from Wegmans, which helped greatly. Overall a great and well executed plan on our part. Feel free to email me if you are itching for some recipes! Hi I'm Nessa! Welcome to my corner of the web. While I've been blogging for over three years, I'm dipping my foot into different waters. Here you'll find mostly a perspective of my experiences, little moments that I'd love to share with you.